Following what was a most bizarre yet exciting conclusion to the IZOD INDYCAR Series crown jewel race the Indianapolis 500, the open wheel racing tour were destined for another barn burner event at Texas Motor Speedway for their second oval race of 2011. Employing a format which had not been used by Indy-type cars since the early 1980s, the Texas Motor Speedway's event format the essentially splits last year's 550-kilometer distance into two races. A unique spectacle presented to the drivers, teams and fans to the IZOD INDYCAR Series, the Firestone Twin 275s ran with a loaded field of 30 cars for two 114 lap races. Earning pole for the first race through Friday qualifying, the #77 Sam Schmidt Racing car driven by Canadian Alex Tagliani led the field for the start of the Saturday night main event. After an aborted double-file start in which Tagliani was judged to be jumped, the first race's green flag would be dropped on the 30-car field. 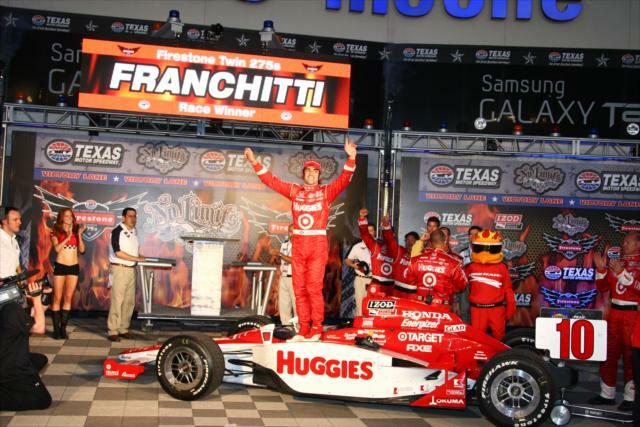 Immediately, front row starting Dario Franchitti piloting his #10 Target/Chip Ganassi Racing car found his way around Tagliani's race car to lead the race's first lap. Though Alex Tagliani was able to sweep back to first place a lap later, the short-lived glory of the Sam Schmidt Racing team would be exhausted as the powerhouse Target/Chip Ganassi Racing #10 car retook the lead. For the first 93 laps, the segment 1 of the Firestone Twin 275s would run without caution. Through long green flas run, Dario Franchitti demonstrated himself as a class above the rest of the field. Relinquishing the lead at Texas Motor Speedway only during the green flag pit stops, the term out in front by one lap leaders Scott Dixon, Helio Castroneves and Vitor Meira would quickly cycle back to Franchitti. From lap 54, Dario Franchitti would maintain the race's top spot to the finish. Winning in St Petersburg for the season opener, Franchitti made a pivotal move in securing overall 2011 year championship points by triumphanting on an oval. Compared to other events, the points earned in the Twin race at Texas were half of a standard IZOD INDYCAR round. A one-two finish for Target/Chip Ganassi Racing, Scott Dixon finished a very close second behind his teammate. Coming just short of passing Franchitti at the start/finish line, Dixon was under attack from a rival. In the first race at Texas, Australian Will Power put down a strong effort in 114 laps qualifying and finishing 3rd. Rounding out the top-5 in the first race of the IZOD INDYCAR Series' Firestone Twin 275s was Alex Tagliani and KV Racing Technology driver Takuma Sato. Bringing out a caution on lap 94, rookie drivers Wade Cunningham and Charlie Kimball collided in turn 4. Cunningham was driving his debut race in the IZOD INDYCAR Series for the Bryan Herta Autosports team that won the INDY 500 13 days prior. The first caution in segment 1 of the Firestone Twin 275s event, the 10 laps under the yellow flag was not only the final time a caution would fall in the first race race at Texas Motor Speedway but the last caution for the night. Initially, many would have hypothesized the expectation of several cautions as the sprint race set-up would have encouraged more aggressive driving. Though the race 1 of the Firestone Twin 275s would not furnish the slowing stages some auto races would need to generate competition, the fast, flat-out speeds of the IZOD Indy cars paired with the 1.5 mile Texas Motor Speedway oval netted created a situation where open wheel drivers were able to muster strong runs. While race two would best demonstrate passing opportunities at Texas Motor Speedway, some drivers showed the promise of gaining positions in race one. Dario Franchitti's teammate Scott Dixon climbed from 7th position to eventually take the runner-up spot in the first Firestone Twin 275s race. Charging from deep in the field, one of the big movers in the first event was EJ Viso for KV Racing Technology. Viso would move up 12 positions to finish 7th after race 1. Moving from 20th to 9th place, Graham Rahal has also posted an encouraging run in the first race at Texas.